Open 3118 High 3144 Low 3021 Closed 3051. Mkt is in danger for further downtrend but bulls managed to push the price higher than prev week high at 3138. Lower low created due to selloff on commodities & panic selling on Friday 050811. Where will be the direction next week. Expected volatility around 3050-3150 depending on econ growth & stronger global index. Based on weekly chart bigger downtrend is eminent with sideways & tight range for future weeks price action. Small range in Session 1 3120-3108. Quick scalping short 3120-3110. Again bearish upon opening. Session 2 open 3118 straight up to 3130. Bulls try to push up the price but failed at 3136 to break prev high at 3138. Small range thereafter. 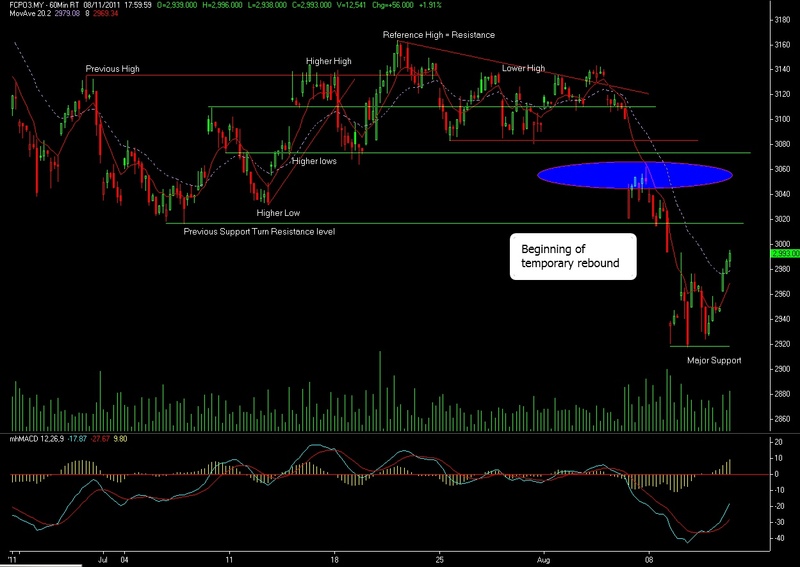 Uptrend is eminent shud mkt cont to break 3138 on next session after breaking prev high at 3127. Open 3126 from 3121. Expected uptrend cont but failed at 3130. 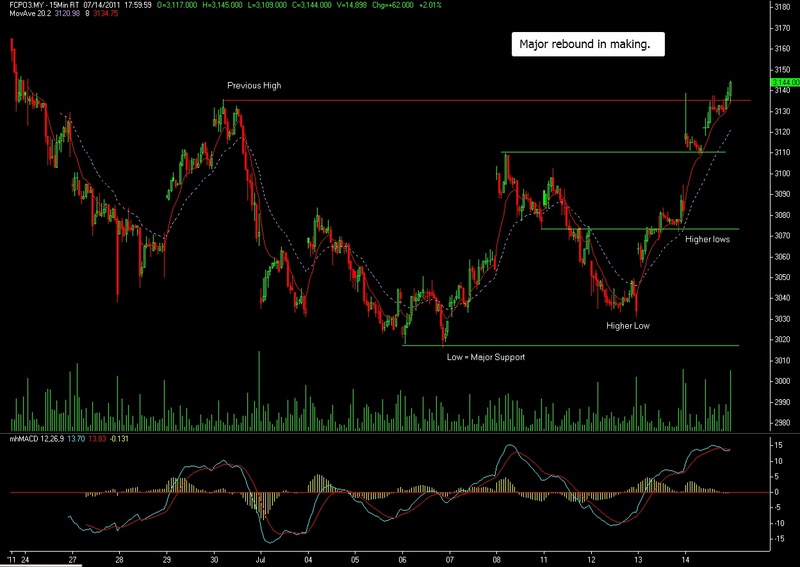 Buy pos at this area wud be jeopardised by failed breakout prev day & as well as failing to break prev day high at 3136. Mkt retraced down to 3107 low for today. Sideway consolidation. Still a few opp at long 3110-3120 vice versa. It seems that at 3130 level traders are very cautious to push up further resulting in a small range tight sideway mkt. Stay short 3130 upwards & long 3100 downwards for safer entry. Bullish market but tight 18pts high low ! Open gap up even soy, crude n dalian in -ve area. Fundamental strong possibly fr lower expectation on stocks. Again good long entry at 3130-3140 & short 3140-3135. 18 pts volatility for sideway uptrend market. Profits cud be more shud the first entry is withtrend. Once entry against u its hard to maximise swing entry. U hv to average the cost or wait for a long time for price to come back or minimise losses. If u r LUCKY !! Bearish Sentiment ! High 3121 down to 3100 signify bears dominant. Good short at opening or near 3121. Small n tight range day. Not much of swing entry opp. Sideway continue wt weak fundamental n bearish global economic news. Still SR works well. Remain sell at (3140-3130) & buy (3100-3110). Panic Selling !! Huge gap down 80pts from 3101-3021. Global panic selling vs strong fundamental limit falls. Good for long at 3021. Bulls dominant in bargain buying n buying at really low price. Closed at 3051 with high at 3063 near res 3064. Good long withtrend at 3050. SR works well but hv to be careful on bearish sentiment. Another good long entry at pullback correction (withtrend retracement) at 3036-3040. KIV for further bulls movement towards 3100 or around 3083-3095. Remain sell at high (3100-3064) & buy at (3016-3040). Open 3117 High 3138 Low 3080 Closed 3096. Consolidation price action. Uptrend momentum been breached when retests prev high failed at 3138. 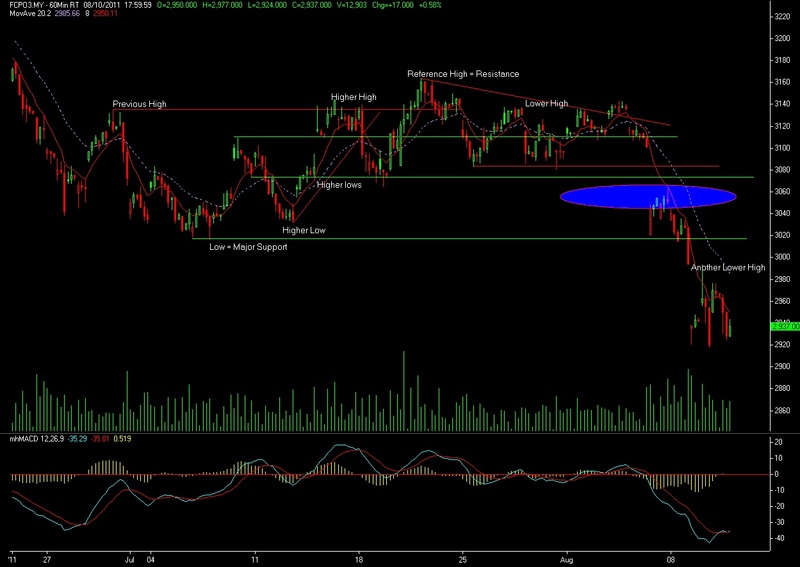 Downtrend is eminent when prev low been breached at 3080. Weaker bullish & stronger bearish on every opening session & towards closing. Awaiting ITS & SGS on 010811 & other external cues for market to move further next week. Nonetheless, swing high & swing low on a daily basis will definitely open up ample opportunities for significant profits. SR works well. Fine tune entry according to current strength. Stick to game plan on Withtrend & Countertrend as well as scalping within stipulated SR.
Upside bias but with bearish sentiment. Gap down twice. Low at 88 then breakout till 3114. Failed to break above yest closing. More bearish on session 2. Low at 3080 breaking major sup at 3083 but body close above 3090. Strong selldown but limited damage. Failed breakout at 3100 sideway till 3106 only & closed lower at 3096. Phsyco level 3100 breached. Cud it be a downtrend ? Hard to tell. Lower high n lower low. Short more safer at strong res – 3130-3110. Although strong selldown at beginning of every session but gradually bulls comes back strongly as well. Look out for fundamental signal on monday (ITS & SGS) for trend confirmation. Shocking start !! Open 3115 selldown to 3085 in 15mins. 23pts 5mins candle !! Always alert at low level that can be breached to chg the trend. If cant break a reversal is always possible. U’ll never know & no 100% guarantee but u must anticipate or else u’ll be missing the boat. At 85 or at least 90-95 would be the best long entry when the body failed to closed lower than this level & failed to break previous lows at 3083. Hold on to the entry as long as with trend till 30-40pts normal volatility at 3120-3127. If against u just manage it accordingly by SL or let it float overnite. So far mkt quiet predictable in terms of bigger range 3000-3100-3200. What goes up will come down & vice versa. Uptrend still eminent but gets weaker as it approach 3130 onwards level. Short 3130 & above, Long 3110 & below. For tomoro anticipate level 3100-3150. Really small 16pts high low volatility. Not good for trading. Traders very cautious on both Bulls & Bears. Overall strength still uptrend but with weakening interest & commitment. Open pos not encouraged at current price action. Closing at 3130. Market can go either way should the strength to go up getting weaker. Another small range day. Both bulls & bears are cautious. Good short at 3118-3095 if can tap the pre opening price & long at 3095-3126 provided SR not breached. Overall still bulls with insufficient strength judging by higher low fr yesterday at 3083 & 3095. 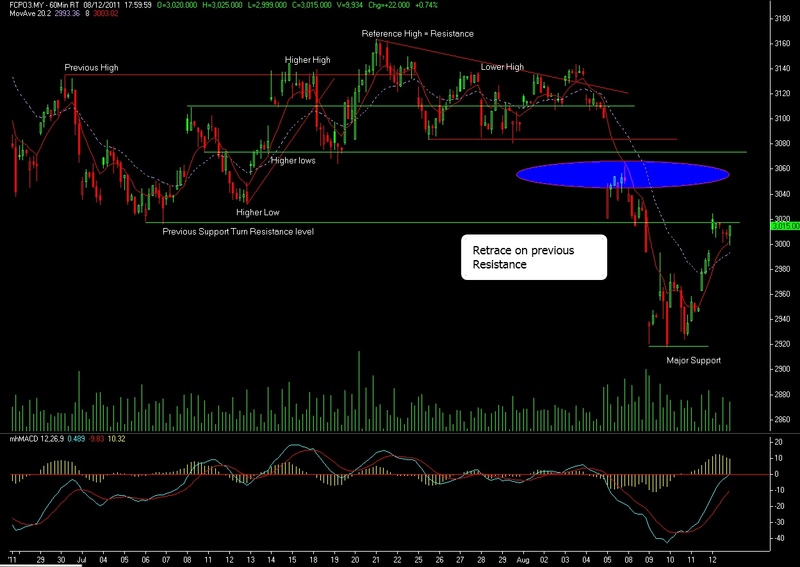 KIV for a retracement towards 3100 for good long entry tomoro. High volatility fr 3126 – 3083 but small range fr 12pm. Overall bearish but retracement is a possibility as expected towards 3100-3110 level with export low export fig at approx 2%. Global -ve news on Soy, Crude & Dalian. If breached 83 to 65 mkt will cont downtrend towards 3031-3016. 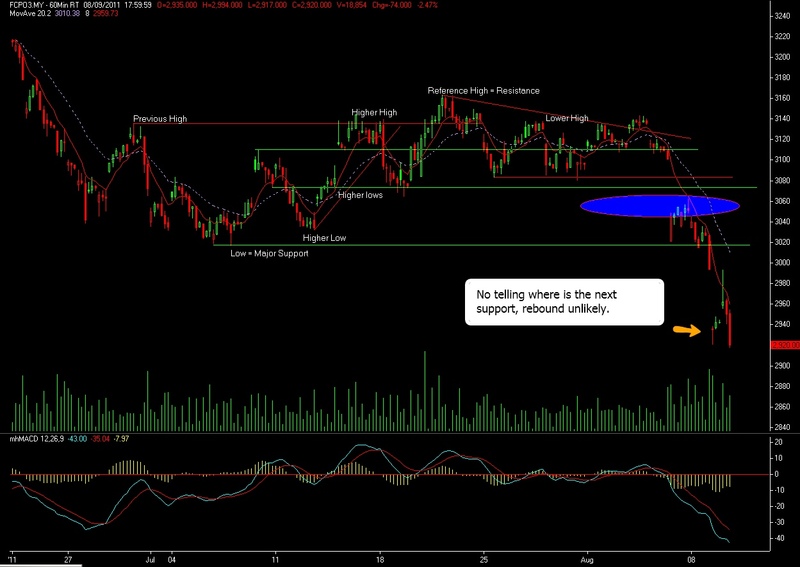 Or else continuation towards 3163-3164 level shud the mkt open higher tomoro. Sell at high res & buy at lower sup will be the best strategy at this tricky market. Not so much of swing high low today but good short at 3126-3100 & long 3084-3100. Open gap down 3126 from 3144. Dalian, Soy & Crude in -ve area. Small & tight range day – 23pts High/Low. Good entry long @ 3123, short @ 3136, long @ 3115 & long again 3123 with quick TP & SL. Overall mkt sideway correction after 2 explosive days of uptrend. High/Low still within yesterday’s volatility. Still uptrend ? Need confirmation on Monday if manage to break Res @ 63. Sup stay at 3115-3110. Open gap up 3117 from 3082. Solid 35 pts & another 10pts on 2nd session. Fierce start 23pts high/low first candle. Good pre session entry at short 3123 & long 3115. Market again on bullish strength wt weaker bearish sentiment. Dalian, Crude & Global +ve news. Cud be beginning of a rebound. Failed to retests previois lows at 3031 & 3055. Realised at 15mins chart there cud be an indicator of a genuine rebound since last Tue when market failed to break 3016 previous lows. Chartpattern always the same no matter in Major Trend or Intraday. Retracement will happen at SR level & breaking highs or lows is very obvious direction. Volume high when bulls market simply shows traders start buying & sentiment getting stronger since yesterday assisted by a big gap in both session. Good few other entry at long 3123, long 3136 & short 3145 for quick profit. Overall bullish will be confirmed should the trend continues tomorrow. Any short position is jeopardised by today’s explosive price action. Open gap up 3064 from 3034. Dalian Effect +60++. Soy & Crude in +ve area. Early bullish sentiment from 55-75. Good entry at Short @ 65 & Long @ 55. Short @ 73 small scalping, short @ 84-87 & long 73. Stall area 75-78 wt downside bias but failed to break 73. Direction changed after 5.30pm by Big Player to high 95 towards the end. Break high 93 & retests 3100 but failed closed lower @ 82. 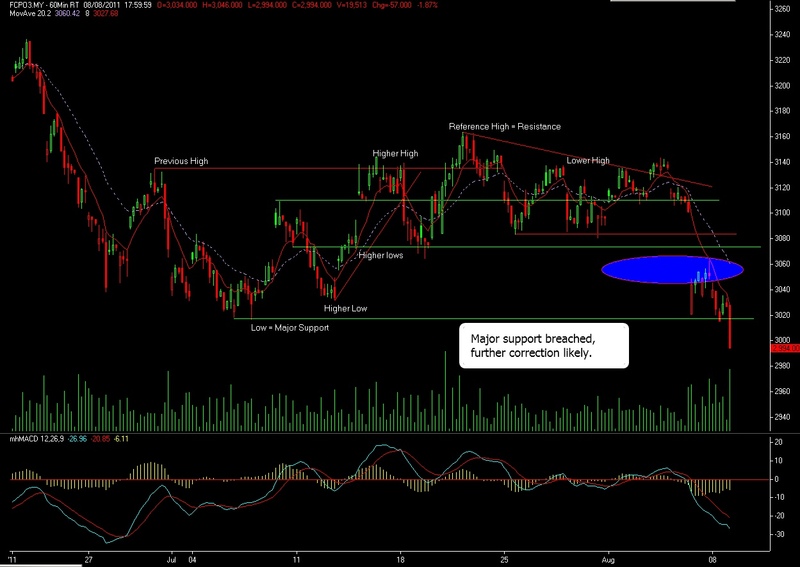 Very tricky trading day & price analysist failed to materialised at 78-73 congestion area. SR works well at designated area wt 3-4 diff. Overall slight technical rebound due to +ve external issues wt China Economic data, Soy & Crude. KIV for main SR area for entry. Missed a few entry points due diff by 3-4 pts at high 93, opening short 65, long @ 55. Stick to game plan at current trend & situation due to uncertainty on market direction. Open gap down 3058 from 3074. Dalian Effect -100++. Soy & Crude also in -ve area. High 58 Low 31. Small range day still few good entry within Major SR. Good short @ 55, Short @ 48, Short @ 41, Long @ 33 & range between 36-44 for small scalping pts. When at the bottom always be alert on weak price action pushing down the price & retests area. Most likely price will rebound after stalling for long time. This will happen only at the bottom area when retests lows are very slow & weak. If in between it works well for counter/with trend. Overall still Bearish sentiment with weakening strength to push down further. Should it gap down tomorrow price might go towards 3014-3000 area. Or else volatility will be in tight range.